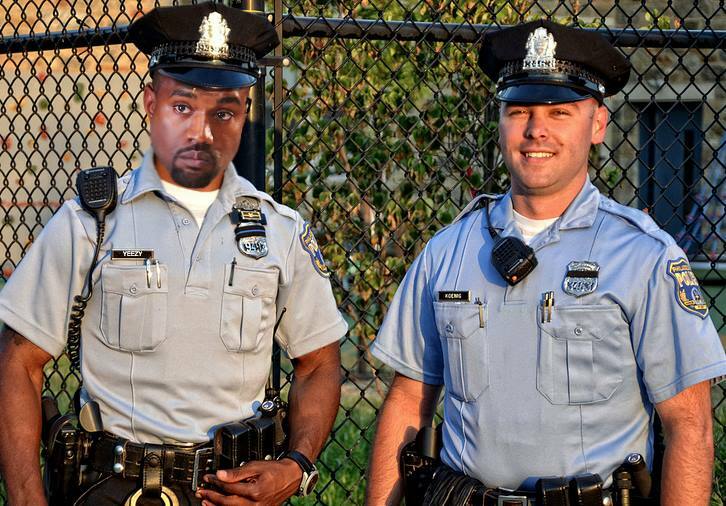 The Philadelphia PD posted this hilarious Photoshopped picture of 'Ye as a police officer. Loving the "Yeezy" badge! Kanye West, famous as a rapper and for his status as Mr. Kim Kardashian, is known for his antics on social media. A few weeks ago he got into Twitter beef with Wiz Khalifa over their mutual ex, Amber Rose. He has also become embroiled in noxious debates with Taylor Swift and a host of others, both famous and otherwise. In one of his most recent Twitter stunts, Kanye complained that he was $53 million in debt as an artist. Last Saturday he tweeted: “I write this to you my brothers while still 53 million dollars in personal debt… Please pray we overcome… This is my true heart.” He went on as to ask Mark Zuckerberg of Facebook if he could give Kanye a billion dollars. The response to Yeezy’s pleas has been… interesting, to say the least. The Philadelphia PD posted this hilarious Photoshopped picture of ‘Ye as a police officer. Loving the “Yeezy” badge! The tongue-in-cheek post was meant to draw attention to the fact that the Department is hiring, and went on to mention the many benefits of working as a police officer. The PPD was far from the only organization trolling West about job opportunities, however. Pizza Hut UK tweeted at Kanye asking him to contact them “about his job application” and suggested that he “stopping telling everyone [he] need[s] some dough and [tries] kneading some dough.” Whataburger also got in on the fun, offering Kanye a job. And then there was Pornhub, which had some licentious suggestions for how Kanye could raise a couple of bucks.